The New Jersey Marathon began in 1997 and has changed names, start and finish locations and course routes many times over the years. Some of the changes have been to enhance the racing experience and others were due to requirements by our host communities. Our current start in Monmouth Park in Oceanport began in 2012. Our current finish on the Oceanfront Promenade in Long Branch begin in 2005. Also, 2005 was the first year of our Half Marathon. In 2011 we began hosting our 2-person Half Marathon Relay, and as a result of the change from a two loop full marathon course to it’s present point to point design. What began as a 700 person marathon race in 1997 has grown to an estimated 12,000 person event in four distinct races in 2014. 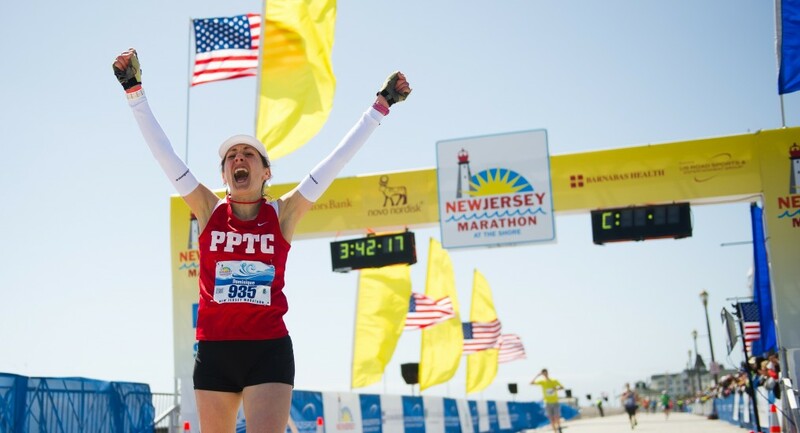 The New Jersey Marathon course traverses 8 Shore communities during it’s 26.2 mile route, and the Half Marathon and Half Marathon Relay courses traverse 3 Shore communities during their 13.1 mile route. Our free Health and Fitness Expo is held at Monmouth Park in Oceanport during the two days prior to race day. In addition to the normal Expo and Packet Pick-up Services, our expo includes a free, very informative series of health and fitness speakers as well as interactive movement classes (including high energy classes two days before our races to Yoga and stretching, etc. on the day before our races) . Please include these free events when planning to attend our Health and Fitness Expo and Race Packet Pick-up Service. We also host kids fun events at our Expo on both Friday and Saturday afternoons. In addition to our Sunday races and two day expo, we also host a Family Fun Day on the morning prior to our main races, at the Finish Area. The Barnabas Health Family Festival & Kids Races events include: a 1.2 mile “Kids Marathon”, shorter races for young children, as well as a mini fair, clown, face painting, fun bus, etc. Also, we will be announcing local events over race weekend, as well as the location and names of the on-course entertainment, prior to race week. I’m curious to find out what blog system you happen to be working with? I’m having some small security problems with my latest blog and I would like to find something more risk-free. Do you have any suggestions?